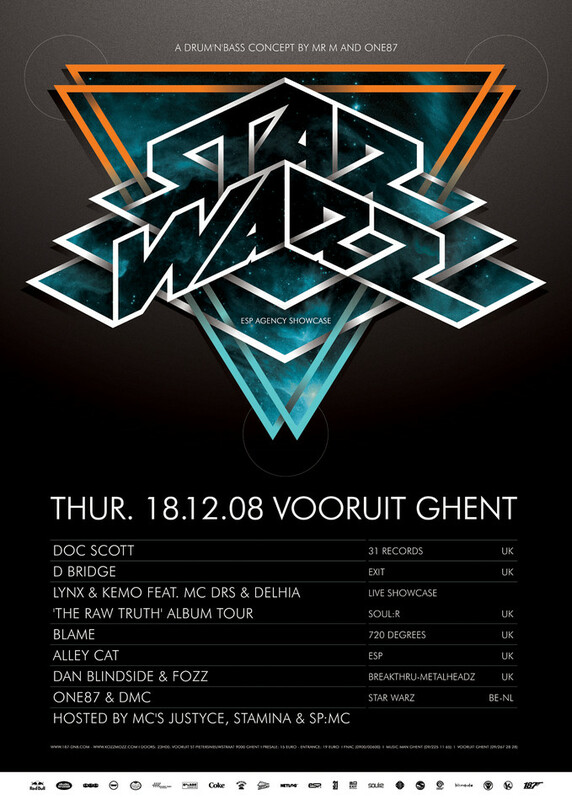 With a combined experience of 20 years, Belgium’s premier Drum ’n’ Bass event Star Warz, and ESP, one of the busiest agencies in the scene, have joined forces to give the Belgian fans an early Christmas present and a monumental night at Vooruit with some of the finest artists ESP has to offer. On Thursday, 18.12.2008 DJ legends such as Doc Scott, D-Bridge and Blame go head to head with younger talents like Alley Cat and a live showcase by Lynx & Kemo feat. MC DRS & Delhia. Masters of Ceremony are Stamina MC, MC Justyce and SP:MC. Support comes from Star Warz residents One87 & MC Dapper and Dan & Fozz from Blindside (UK). Since it’s beginnings in 1996, ESP Agency has built up a name for itself as an internationally trading Drum ’n’ Bass artist agency, with thousands of bookings all over the globe. ESP has worked with 100 capacity clubs as well as 60,000 capacity festivals, and booked their artists all across the UK and Europe, and as far afield as New Zealand, Honolulu, China, Korea, Siberia, Brazil and South Africa, and just about everywhere in between. The Agency currently represents high profile artists and brands including Black Sun Empire, Blame, Calibre, D-Bridge, DJ Storm, Doc Scott, Dom & Roland, Klute, Lynx, Marcus Intalex, Stamina MC, SP:MC, MC DRS, MC LowQui, MC Justyce, Metalheadz, 31 Records, Soul:ution, AbunchOfCuts.com, Feline, Commercial Suicide, and more. ESP does not only feature a versatile and highly skilled roster, but prides itself a professional and friendly approach towards artists and promoters alike. It is these qualities that have helped build a lasting connection between Belgium’s premier D’n’B Night Star Warz and the agency, which culminates in the first ever ESP Agency Showcase in Belgium. After having previous such nights in London, Germany, Switzerland, Portugal and Sardinia, the 18th of December 2008 will mark one of the biggest ESP line-ups ever to be featured on one single event. Taking over the main room at Vooruit, the crème de la crème of ESP acts will provide the Belgian crowd with a musically varied night to remember. Besides some familiar names such as Doc Scott and D-Bridge this night will see the return of Blame to Star Warz after two years as well the mainland Europe exclusive debut live showcase of bright stars Lynx & Kemo feat. MC DRS and Delhia in support of their forthcoming album ‘The Raw Truth’ (Soul:r). Another Star Warz debut is that of one the premier female d’n’b djs and ESP Agency co-director Alley Cat, and vocal support comes from Stamina MC, SP:MC, and MC Justyce who have all been rocking the Voorruit stage many time before. Support for the ESP crew comes from Dan & Fozz from Blindside, the like-minded promoter of one of the UK’s best d’n’b nights Breakthru and of course Star Warz head honcho One87 alongside MC DMC.